Iron Age remains, Rough Tor. Rough Tor (/ˈraʊtər/), or Roughtor, is a tor on Bodmin Moor, Cornwall, United Kingdom. The site is composed of the tor summit and logan stone, a neolithic tor enclosure, a large number of Bronze Age hut circles, and some contemporary monuments. In the 19th-century the hill was known as Router. Rough Tor is approximately one mile northwest of Brown Willy, Cornwall's highest point, on Bodmin Moor. Its summit is 1313 ft (400m) above mean sea level, making it the second highest point in Cornwall. Both hills are in the civil parish of St Breward and near the town of Camelford. The De Lank River rises nearby and flows between the two hills. Rough Tor and Little Rough Tor are twin summits of a prominent ridge of granite, though there are actually three tors at the site: Showery Tor, Little Rough Tor, and Rough Tor. Crowdy Reservoir and the Lowermoor Water Treatment Works are not far away from the hill. Hikes to the summit and to neighbouring Brown Willy are popular, though the walk may be strenuous; a road provides easy access to a car park, which is about a mile and a half from the summit. From the summit of Rough Tor, many signs of settlements and field systems are visible, indicating that it was a well populated area in former times. The summit of Rough Tor once had a neolithic tor enclosure. The summit is encircled by a series of rough stone walls that align with natural stone outcroppings on the tor. The walls would have originally completely encircled the tor. The walls would have had numerous stone lined openings. In the interior of the circle, there are remains of terraces levelled into the slopes, which archaeologists believe formed the foundations of circular wooden houses. There are also cleared areas near the terraces that have been garden plots. The Rough Tor enclosure is located in an area containing a remarkable concentration of upstanding monuments and other Bronze Age sites, such as Fernacre stone circle, which is only 200 meters from the site. Stannon stone circle is also located nearby, and there are numerous cairns and burial monuments in the vicinity. On the southern slopes of Rough Tor, there are the remains of a large number of stone hut circles, set around three or four enclosures that may have held stock. There are also the remains of a large field system, which is partially overlain with a medieval field system. The purpose of this field system has been debated, with historians disagreeing as to whether the fields were used for cereals or for stock. The summit of the tor was once the site of a medieval chapel, which was built into the side of one of the cairns, and was dedicated to St. Michael. The chapel was recorded in the 14th century, and is the only known hilltop chapel on Bodmin Moor. As it overlooks an ancient trackway across the moor, it may have served as a guide for travellers. There are remains of a second medieval building at the bottom of the summit and a beacon may have been maintained here or at the summit by a hermit. A medieval field system based on straight lines overlays the Bronze Age field system at Rough Tor, and several medieval artifacts have been found in the area, such as the base for a stone cross, and a small stone cross. There is also a memorial to Charlotte Dymond, who was murdered on the Tor in 1844. In a programme shown in 2007 Channel 4's Time Team investigated a 500-metre cairn and the site of a Bronze Age village on the slopes of Rough Tor. 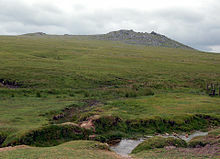 There is also a Rough Tor on Dartmoor in Devon, three miles west of Postbridge. The early colonial name for Mount Barrow, in Northern Tasmania, was 'Row Tor, - believed to be the homonym of 'Rough Tor': named by Matthew Flinders on his maritime survey. ^ "Newlyn East: Past and Present". The Cornishman (110). 19 August 1880. p. 8. ^ a b "Rough Tor - Bednobs Bed and Breakfast". ^ a b "Rough Tor". Cornwall's Archeological Heritage. ^ a b "Rough Tor Settlement (South)". Cornwall's Archeological Heritage. ^ "Bodmin Moor, Cornwall". Channel 4: Time Team. 8 April 2007. Retrieved 9 November 2009. ^ Prettyman, Ernest. "Tasmanian Archives Online_ The Prettyman Index to Tasmanian Place Names". Retrieved 2 October 2015. ^ Johnson, R.M. "Notes on the Geology of Lake St. Clir" (PDF). University of Tasmania. Retrieved 2 October 2015. This page was last edited on 11 April 2019, at 18:52 (UTC).